Sun Valley Wedding Photographer Todd Nichols Photography takes pictures at Our Lady of the Snows catholic church. 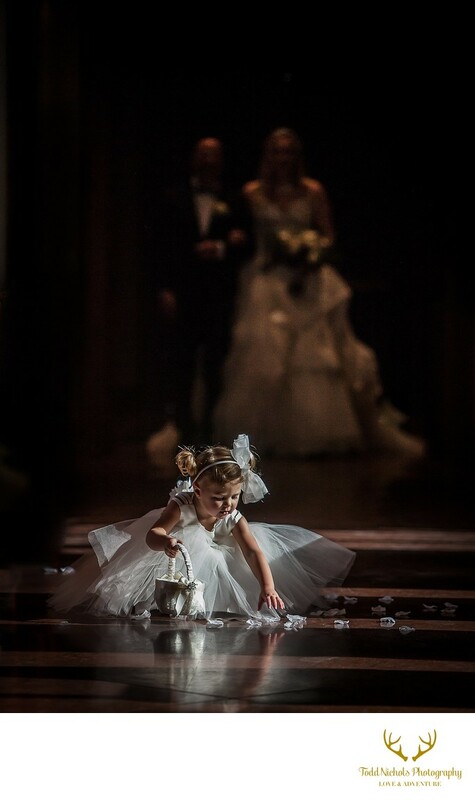 This precious flower girl threw her petals and then wanted to pick them all back up to make it pretty for the bride. She was adorable. We took this wedding picture as she bent down to gather a few petals and caught her in this beautiful light! We love Sun Valley Weddings at Our Lady of the Snows because of the gorgeous light! A unique feature of this church is the chandelier which forms a baldachino (canopy) over the altar. It is a one of a kind work of art commissioned just for this church. The artist is Sharon Marsten, from London, England. The piece is 24 feet long and is constructed with 1,600 fiber optic filaments and 2,200 hand-blown glass crystals. 1/5000; f/2.8; ISO 1600; 155.0 mm.